Fourteen of our Laser sailors headed North last week to Ballyholme Yacht Club for the ISA Youth Pathway Nationals Championships 2017. 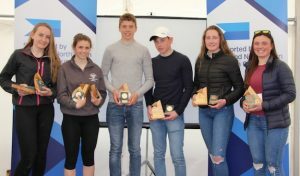 Johnny Durcan was our top radial sailor followed by Tara Coveney, Tom Keal, Paddy Cunnane, Amy Carroll and Molly Murphy. We took first and second place in the 4.7 class with Jack Fahy followed by Caoimhe Foster who got 3 bullets in her last three races. 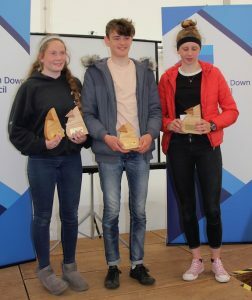 David Carroll and Sophie Crosbie also recorded top 10 finishes closely followed by Conor Walsh, Maeve O’Sulllivan, Cathal O’Regan and Mia Murphy. 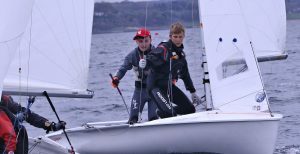 The Topper and Laser 4.7 fleets were coached by three time Olympian and local Ballyholme sailor Ryan Seaton. 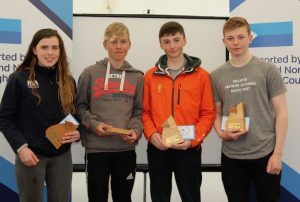 In the Toppers, six club sailors raced over the three days with Rob Keal (first) and Conor Horgan (third) on the podium. There were strong showings also by Ciaran Ryan, Ellie Cunnane, Kate D’Arcy and Aoife Byrne who all finished in the top half of the 32 boat fleet. 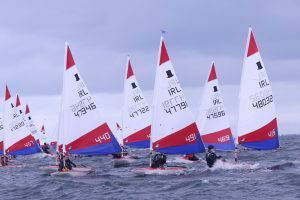 The 420 fleet was as competitive as ever with sixteen entrants. Our own James McCann took the overall honours while sailing with Geoff Power of WHSC. A great result with some very tight racing. Other Club members – Micheal O’Suilleabhain and Michael Carroll were 5th. Credit also to our all girl paring of Sarah Levie and Emily Whitaker who completed the club line up in this fleet. Thank you to all the parents who helped on and off the water – without your support this would not happen. Full results can be found here. Event photos by Simon McIlwaine of Wavelength Image can be found here. Video of the event by Six Nine One media on the link below.